"This item will ship out immediately. Previously owned, unless otherwise stated. 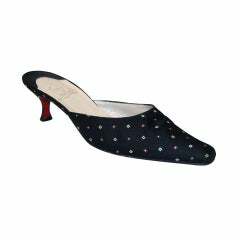 37 Fits like us 6.5 Kidskin forms signature Christian Louboutin silhouette. Stretch-inset on slingback strap provides secure fit. 5" stacked heel shows off signature Christian Louboutin red leather outsole. Peep-toe reveals 1" platform; 4" equiv. Leather lining. Padded leather insole. "No Prive" is made in Italy. OVERALL GOOD CONDITION ( 2 or B ) Signs of Wear: Some marks on leather, as photos depict. Red Bottoms show occasional use. No Box. Scale: 5 =New 4= Excellent 3= Very Good 2= Good 1= Fair 0=Needs Work This item does not come with any extra accessories. Please review photos for more details. Color appearance may vary depending on your monitor settings.